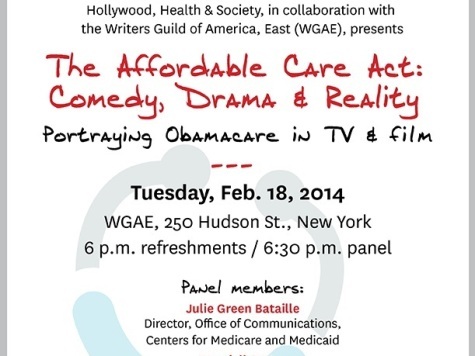 According to an email invitation sent out by the Writers Guild East and obtained by Breitbart News, members of the Hollywood elite and the Obama Administration will be gathering in the middle of next month for a panel titled, “The Affordable Care Act: Comedy, Drama & Reality – Portraying ObamaCare in TV & Film.” Julie Green Bataille, a director at the Centers for Medicare and Medicaid Services (CMS), will represent the Obama administration. 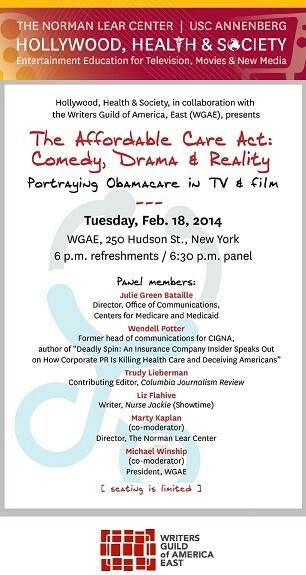 The left-wing Norman Lear Center is co-sponsoring the event. Two powerful left-wing Hollywood organizations combining with the federal government’s powerful CMS is not something to be taken lightly. The intent here is obvious and deadly serious, and the American people should brace themselves for a propaganda push in their film and television entertainment that is meant only to aid and abet Obama’s federal government. This invitation should serve as a reminder that, with rare exceptions (that only prove the rule), Hollywood is not filled with brave rebels, iconoclasts, and individual thinkers; but rather they are servants eager to do their government’s bidding and who understand that success in the entertainment business means never coloring outside the lines of left-wing conformity.